Love, hate, death, youth, kissing, fighting – Shakespeare, now he knew how to write a play! For their seventh production Barnstorm’s Kilkenny Youth Theatre presented the ultimate tale of star-crossed lovers, William Shakespeare’s ‘Romeo and Juliet’. Following on from the success of the twisted Gormenghast and the noir KoHL, Kilkenny Youth Theatre look forward to taking on The Bard. ‘Romeo & Juliet’ had a cast of 14 young Kilkenny people who presented this tale of woe, of joy, of love and hate, youth and age, life and death. 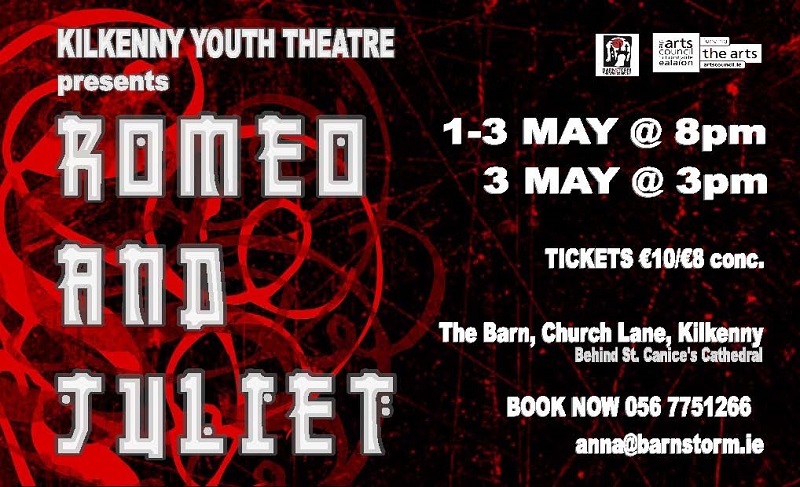 In true Kilkenny Youth Theatre fashion, the production took the twist of taking influences from Japanese Manga to inspire costume and props whilst maintaining the richness of Shakespeare’s language. 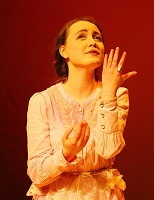 Alannah Canton, 17, played Lady Capulet. She said she was excited about acting in Romeo & Juliet and says ‘It is good to see how it translates onto the stage’, and that performing in the play ‘makes it easier to see the relationships between the characters’. The reason Kilkenny Youth Theatre chose ‘Romeo and Juliet’ was most people loved the play and some where about to study it. When most young people first encounter Shakespeare, it is usually in the context of language and study, rather than live performance. It was hoped that this experience would change that for the group and the young people who came to see it. ‘Romeo & Juliet’ is ran to full houses for four performances – Thursday 1st-Saturday 3rd May at 8pm, with a matinee on 3rd May at 3pm – at The Barn, Church Lane, Kilkenny.